Beautifully updated home on lovely street in central location. 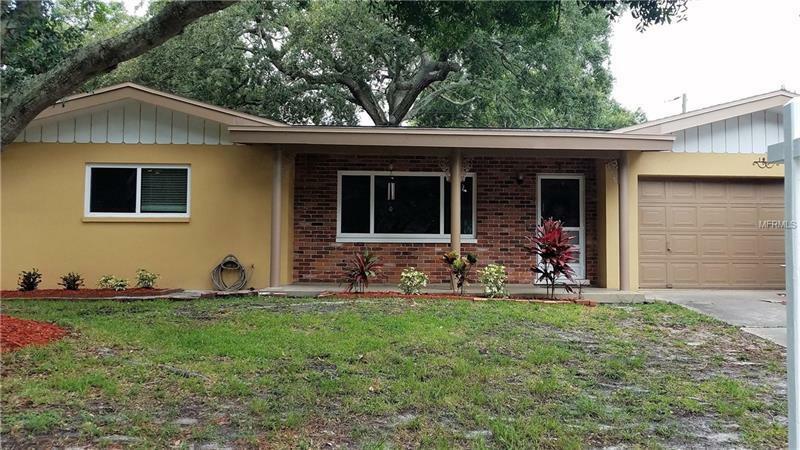 With its spacious, split bedroom floor plan, this home boasts a completely new central air system, new roof, gorgeous picture windows, an abundance of natural light, and so much more. The Kitchen features new stainless Samsung appliances, lots of cupboards, deep double sinks, and pretty beige granite counters. The Master bedroom is big and bright. It has a great walk-in closet and roomy Master bath with walk-in shower, metallic tile accents, large vanity, and built in glass shelving. The other bedrooms are spacious too; each are lit up with sun and have a full length closet. The Guest bath is pretty and light. The fixtures look beautiful with the porcelain tiles. With extras like the large bonus room, linen and storage closets, pantry, decorative molding, and functional layout, this home offers incredible value. The lot has green lawn and some landscaping with beautiful mature oaks. There is a large front and rear patio and the backyard is enclosed. Great schools, a playground, Pinellas Trail, golf, restaurants and shopping are nearby.